MUAR: All main roads into the district will be adorned with landmarks of ‘elephant tusks’, in preparation for Bandar Maharani’s official declaration as the royal town of Johor. Muar district officer Amran Abdul Rahman said Johor Ruler, Sultan Ibrahim Sultan Iskandar had decided on the matter and the Public Works Department would design the landmark. He said other districts too would have similar landmarks but they would be installed in conjunction with the Sultan’s coronation in 2013. “The Sultan recently declared Bandar Maharani as the royal town of Johor at the state-level Maulidur Rasul gathering here on Feb 5. Another landmark: The old Muar courthouse which the Government has returned to Johor after the new Muar courthouse complex near Parit Perupuk was built. “We had discussions with the Sultan after that and consulted with the him that there should be an official occasion to declare the town as a royal town,” he said in an interview on Wednesday. 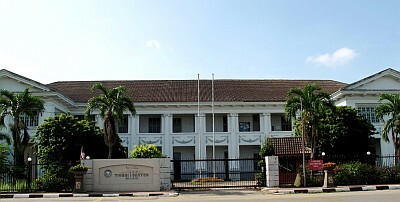 Following the Sultan’s agreement on the matter, Muar had planned to set up the landmark before the official declaration, which was expected to be within this year. He said the elephant tusk landmark would be set up in five areas and would also have the words ‘Bandar DiRaja’. He said the areas identified were at the bridge in the town, Muar’s second bridge near Sabak Awor, near the Pagoh toll plaza, along the Yong Peng – Muar road and along the Batu Pahat – Muar road. However, he said, if all the five projects could not be completed this year, two landmarks would be constructed initially to commemorate the day of declaration. “We were actually surprised when the Ruler decided to declare this town as the royal town of Johor. “However, we are honoured and grateful to the Sultan and will do our best in keeping the town clean and beautiful,” he said. Amran also said that three complexes – the old Muar courthouse along Jalan Petri, the old Talikom Malaysia building along Jalan Majidi and the Tanjung Emas Marina, which belonged to the Federal government, had been passed over to the state. He said both the old courthouse and the Talikom Malaysia buildings were handed over except for the Tanjung Emas Marina as there was still outstanding monies owed to the Harbour Master’s Department. He said there were plans to turn the old courthouse into the district’s Syariah Court but there were also suggestions for it to be turned into a museum. “We will let the state decide on the future use of the buildings.